Politics of Hungary takes place in a framework of a parliamentary representative democratic republic. The Prime Minister is the head of government of a pluriform multi-party system, while the President is the head of state and holds a largely ceremonial position. Executive power is exercised by the government. Legislative power is vested in both the government and the parliament. The party system since the last elections is dominated by the conservative Fidesz. The two larger oppositions are Hungarian Socialist Party (MSZP) and Jobbik; there are also opposition parties with no formal faction but representation in parliament (e. g. Politics Can Be Different) The Judiciary is independent of the executive and the legislature. Hungary is an independent, democratic and constitutional state, which has been a member of the European Union since 2004. Since 1989 Hungary has been a parliamentary republic. Legislative power is exercised by the unicameral National Assembly that consists of 199 members. Members of the National Assembly are elected for four years. The Economist Intelligence Unit has rated Hungary as "flawed democracy" in 2016. The President of the Republic, elected by the National Assembly every five years, has a largely ceremonial role, but he is nominally the Commander-in-Chief of the armed forces and his powers include the nomination of the Prime Minister who is to be elected by a majority of the votes of the Members of Parliament, based on the recommendation made by the President of the Republic. If the President dies, resigns or is otherwise unable to carry out his duties, the Speaker of the National Assembly becomes acting President. Due to the Hungarian Constitution, based on the post-World War II Basic Law of the Federal Republic of Germany, the Prime Minister has a leading role in the executive branch as he selects Cabinet ministers and has the exclusive right to dismiss them (similarly to the competences of the German federal chancellor). Each cabinet nominee appears before one or more parliamentary committees in consultative open hearings, survive a vote by the Parliament and must be formally approved by the president. In Communist Hungary, the executive branch of the People's Republic of Hungary was represented by the Council of Ministers. 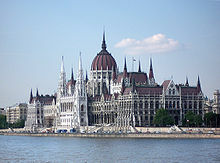 The unicameral, 199-member National Assembly (Országgyűlés) is the highest organ of state authority and initiates and approves legislation sponsored by the prime minister. Its members are elected for a four-year term. The election threshold is 5%, but it only applies to the multi-seat constituencies and the compensation seats, not the single-seat constituencies. For other political parties, see List of political parties in Hungary. An overview on elections and election results is included in Elections in Hungary. A fifteen-member Constitutional Court has power to challenge legislation on grounds of unconstitutionality. This body was last filled on July 2010. Members are elected for a term of twelve years. The President of the Supreme Court of Hungary and the Hungarian civil and penal legal system he leads is fully independent of the Executive Branch. Several ombudsman offices exist in Hungary to protect civil, minority, educational and ecological rights in non-judicial matters. They have held the authority to issue legally binding decisions since late 2003. The central bank, the Hungarian National Bank was fully self-governing between 1990–2004, but new legislation gave certain appointment rights to the Executive Branch in November 2004 which is disputed before the Constitutional Court. Hungary is a member of the ABEDA, Australia Group, BIS, CE, CEI, CERN, CEPI EAPC, EBRD, ECE, EU (member, as by 1 May 2004), FAO, G-9, IAEA, IBRD, ICAO, ICC, ICRM, IDA, IEA, IFC, IFRCS, ILO, IMF, IMO, Inmarsat, Intelsat, Interpol, IOC, IOM, ISO, ITU, ITUC, NAM (guest), NATO, NEA, NSG, OAS (observer), OECD, OPCW, OSCE, PCA, PFP, SECI, UN, UNCTAD, UNESCO, UNFICYP, UNHCR, UNIDO, UNIKOM, UNMIBH, UNMIK, UNOMIG, UNU, UPU, WCO, WEU (associate), WFTU, Visegrád group, WHO, WIPO, WMO, WToO, WTrO, and the Zangger Committee. Note: with restructruring and reorganization, this information may change even within a governmental period. ^ Website of the Prime Minister's Office. Retrieved 31 January 2010.